As organizations move to modern management to be more agile in the way they manage multiple types of devices and cloud based services, the legacy management models associated with traditional PC management can lead to multiple consoles for managing different types of devices and services. At Microsoft Ignite this year, a hybrid approach called “Co-management” was announced. to bring organizations closer to modern management while still maintaining traditional management methods. In the past it has been difficult to use more than one management platform for the same device. Windows 10 1709 opens the doo this co-management by allowing devices to be managed simultaneously with SCCM 1710 and with Intune. What are the benefits of co-management? Here’s a few that come to mind. Manage devices where they live. Use SCCM to manage devices that are primarily on premise and use Intune to manage the same device when it is roaming. Add modern management functionality to traditionally managed devices. Consider device compliance policies, resource access policies, Conditional access, selective wipe, factory reset etc. Single pane of glass for consolidated views of all devices such as mobile phones, tablets, Macs, PCs. Transition Windows 10 devices to Intune while managing legacy (Windows 7) devices with SCCM until they are upgraded or lifecycled. So, is this the best of both worlds? Nto really. 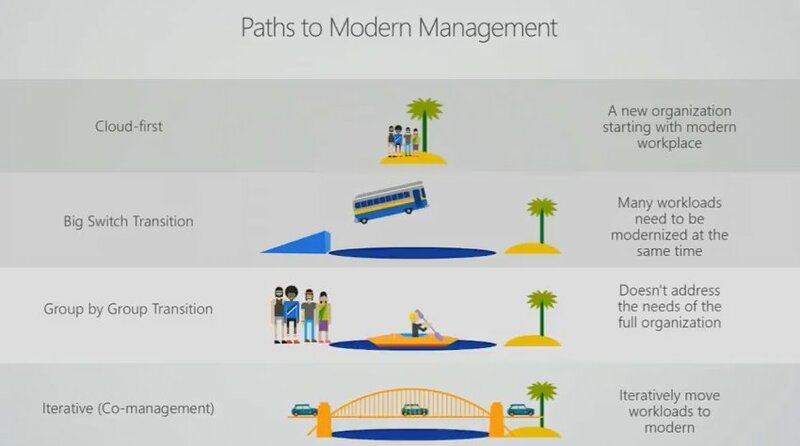 Microsoft views this as a transitional step on the journey to modern management. Nonetheless I’m excited about the new opportunities for organizations to deliver a better user experience. This entry was posted in Configuration Manager, InTune, MDM, Windows 10. This is not a business requirement as it is not tied to any business process that creates value. There may be value in achieving the end result but the statement does not convey the value. Additionally, the cost associated with the solution may eclipse any value. This does not in itself create any new capabilities for the organization. It simply shifts existing capabilities to a new form factor. The user experience of trying to use desktop applications that are designed for a mouse and keyboard on an iPad could create negative value. Most experienced tablet users would agree that tablets are better suited to content consumption rather than content creation. While technically possible, data/content creation is generally more efficient in a more traditional form factor. Apps designed specifically for a tablet form factor for specific mobile solutions like form completion that includes prepopulated selections (E.g. point of sale, survey taking, etc.) create new business capabilities that take advantage of the mobility enhanced form factors. Notice that Devices is dealt with first last. Many organizations are designing their MDM as a reaction to the devices that are being brought into the workplace – This is akin to designing the aircraft while it is in flight. Although I take a more strategic approach that avoids dealing with devices at the outset, don’t dismiss this approach if you already have devices that you need to deal with. Remember that the device refresh cycles can be very short and the cost of new devices is very low. A well planned strategy can create ROI even if device replacement is required. What are the authentication requirements for users to be able to remotely access company apps from their devices? Where will the authentication services reside and how will they be managed? Is the current platform able to enforce authorization per user and per app without having to rewrite the apps? Is it possible to enforce Multi-Factor Authentication according to a user’s location? How will data be stored on user’s devices? Will it be encrypted? What is the risk of data loss is it cannot be decrypted? What is the risk of data los if the device is lost and the data is not encrypted? Will any corporate data stores be accessed by the device? Where is the data located (datacenter, cloud, other)? Will additional safeguards be required for the data being accessed? Will it be encrypted? How will data be transferred to and from the device? Will it be encrypted in motion (HTTPS, IPSEC)? Will the safeguards impede the UX? These are just a sample of the items you might want to consider as part of your MDM strategy. Please let me know if there are other items that you would consider when defining your data access and protection strategy for mobile devices. Devices are evolving at a rapid pace. They computational capacities are astounding and the built in manageability is iterating very quickly. Don’t let the capabilities of your current installed base of devices influence your long term strategy. There are many things to consider in designing an MDM strategy. A great place to start is by asking what new capabilities your strategy needs to enable and what outcomes are desired. A good approach s to project your business at some point in the future (2 years) and envision what the business, customer, and user experience would be like if you had an effective MDM strategy in place. Capture that vision and use it to help you answer the questions that will shape your MDM strategy. This entry was posted in BYOD, MDM, Mobile Device Management. Last post I discussed the types of questions that need to be answered about your mobile users and their requirements. The takeaway was to understand the relevant use case scenarios and personas. In this post we will dig a little deeper and explore some of the security implications of providing different user personas with the mobile capabilities required for specific scenarios. I’m going to consider Data Access and Protection together from an implementation perspective but from a design perspective the can (and should) be decoupled. Again, this series is not intended to provide you with an MDM strategy. The intent is to make sure that you are asking the right questions during the design phase of your MDM project so that the end result provides the capabilities and outcomes that best meets your organization’s needs. Now that we have a covered Applications, Users, Data Access and Protection, I plan to discuss Management and Devices in the last two posts in this series. Stay tuned.